To show a photo in a post it has to be located somewhere on the Internet. 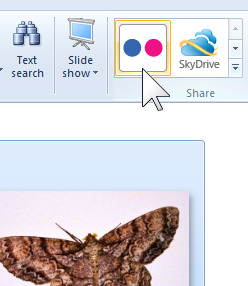 You can use Windows Live Writer to upload images to your blog service image store, or you can do it manually. You can also insert the address of a photo stored on another service on the web. Flickr makes it particularly easy to source photos for a blog. Flickr, the popular photo-sharing service from Yahoo!, is widely used by bloggers for their photo storage. To use it, you need an account, of course. Flickr offers a free account and a Pro account, for many bloggers the free account is quite sufficient. 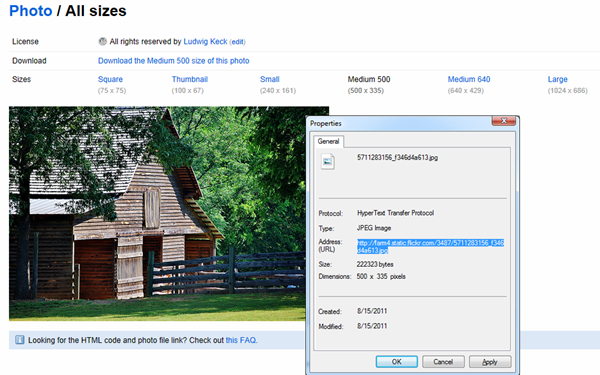 Windows Live Photo Gallery can upload photos directly to your Flickr account. 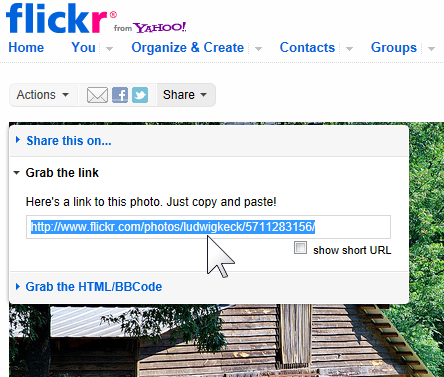 To upload, select the thumbnails then click the Flickr symbol in the Share group of the Home ribbon. 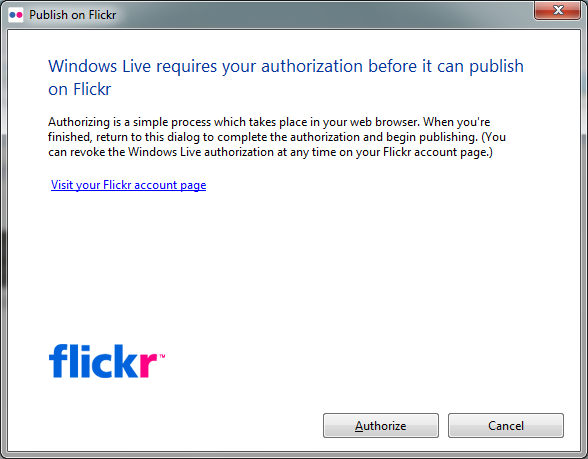 If this is the first time you are uploading to Flicker, you will see a dialog telling you that “Windows Live requires your authorization before you can publish on Flickr”. The Authorize button opens the browser and takes you to your Flickr account. Sign in and step through the authorization process. Close the browser when finished. Back in the Live Gallery dialog, click Authorize again and the upload process starts. You need to go through this only once. After that, Live Gallery will remember the settings and the upload proceeds smoothly. The upload dialog allows you to choose the account and the “set”, Flickr-speak for album, for the uploads (ignore this, it doesn’t work), you can also specify the “Photo size”. Live Gallery will resize your photo to this size before uploading. I suggest you choose 1024 pixels. More on this shortly. The last option is “Public” or “Private” (several settings). Leave this on public. Then click Publish. 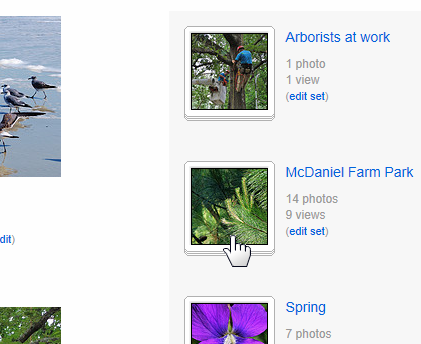 After the upload the browser opens and you can view your uploads in Flickr and select the set and add other details. If you use the free Flickr account, your original uploaded photos will be inaccessible. Flickr makes JPG copies, the largest being 1024 pixels on the largest side, plus several smaller ones. These will be accessible to you. For use in a blog, you do not even need the 1024 px size, however it might be nice to link to the large size so your readers can see it in good detail. More on this below. Once you have photos on Flickr, you will need the web address, URL, of a photo to insert into a blog post. Go to your Flicker photos and select the one of interest. Click on Actions (above photo on left) and select View all sizes. Select the size that you wish to insert into your post, or the next larger size if what you want is not there. Right-click on the image. In the menu select the web address. If you are using Internet Explorer, click Properties to get to the address. Copy the address (Ctrl+C). 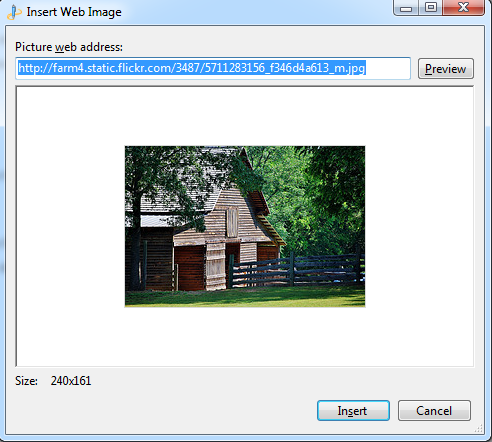 Paste the URL in the Live Writer Insert – Picture – From the web… dialog. The URL you got is the address for the actual image. There is one other address you will want. Back in the Flickr page for the photo, click on Share (see illustration here). Click in the text box under Grab the link and copy this address. This address is actually the address of the Flickr page for this photo. You can use this as the hyperlink assigned to the image in your post. Maybe this is getting ahead of the story just a bit, so let’s go over the details for inserting a photo into a blog post. Above I explained how to get two web addresses, one to the image itself, the other to the Flickr page that shows the photo. Here is how to insert the photo into the text of a blog post in Live Writer. Pick the place for the image. In the Insert group (Home tab), or Media group (Insert tab), click Picture. Click From the web… in the dropdown menu. This opens an “Insert web image” dialog. Paste the URL of the image into the the address field. A view of the photo will be shown in the main area. If you do not see this small image, then the address you entered is not valid. The Flickr page address will not work here. This must be the URL of an actual image. Click Insert and the picture will be placed into your post text. 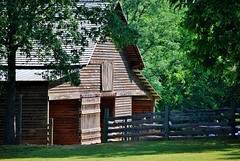 I have done this here with the barn photo. Note that when you click on this picture, the “Picture Tools” ribbon will be available. There will be just two “Picture styles” offered. A frame (shown in blue) or no frame. This is true for all images sourced from a web location. The Size options will be available. The best size to use is Original, that is as it is stored in Flickr. You can choose a smaller size, even specify the number of pixels for width or height. When a reader views your post, the stored size is downloaded to the browser and resized as specified. If you chose Original then that resizing will not be needed. You can select a larger size than original and the browser will scale the image up. It will, of course, loose resolution, so this is not recommended. You will want to offer your reader a larger view of your photo, so send your fan back to your Flickr photo. 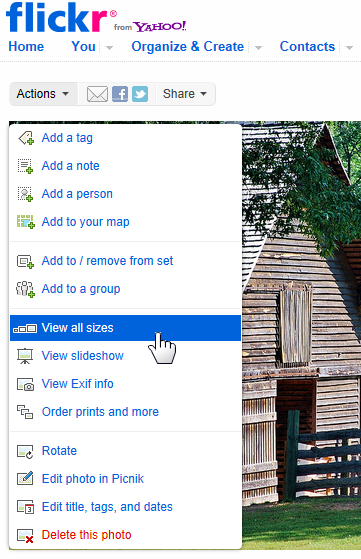 You can use a hyperlink to the largest image that was shown in the Flickr “View all sizes” page. Such a link will show the photo bare of any other details in the browser. It may not be centered or set in an appealing way. This is where the other address comes in. It takes your reader to the photo page with all the additional info around it. Your reader can click the photo to see it in the slide view mode. You can take her or him directly to that view. Remember the address you got for the page, it looks like this: http://www.flickr.com/photos/ludwigkeck/5711283156/ If you append the word “lightbox” to it, like this: http://www.flickr.com/photos/ludwigkeck/5711283156/lightbox then it takes your reader directly to the photo in slide view mode. Much more appealing. To attach a hyperlink, click on the picture, then click the Hyperlink icon in the ribbon. Paste the Flickr page address into the address field, and click OK. I have done this on the little barn photo above, click on it to see how it works. Back on your Flickr page, select the set you wish to show. In the upper right above the thumbnails, click Slideshow. You can attach that hyperlink to an image, like I have done here, or just show it in your post, like just above. When your reader clicks on such a link, the Flickr slide show will start. Try it here on the picture on the left. 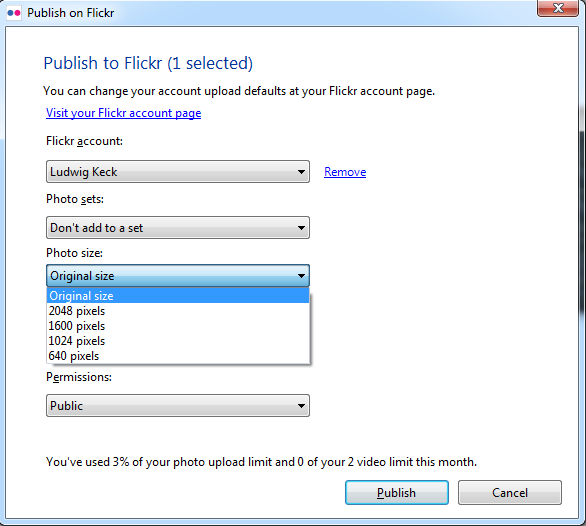 Do link back to Flickr when you post your Flickr content elsewhere. Flickr makes it possible to post content hosted on Flickr to other web sites. However, pages on other web sites that display content hosted on flickr.com must provide a link from each photo or video back to its page on Flickr. This provides a way to get more information about the content and the photographer. Don’t use your account to host web graphics, like logos and banners. If we find you using your account to host graphic elements of web page designs, logos, icons, and other non-photographic elements on other web sites, we will warn you or delete your account. Do upload content that you’ve created. Don’t upload anything that isn’t yours. This includes other people’s photos, video, and/or stuff you’ve copied or collected from around the Internet. Accounts that consist primarily of such collections may be deleted at any time. These rules help us all, so be observant of them.